It's that time of the year again! Our 12 Days of Giveaway is back. Simply visit our site every day for the next 12 days for a chance to win a new prize worth over $200. To kick off this wonderful season of giving, we have a Swarovski Remix Bracelet, which is a versatile piece that you can style as you please. It's a delicate bracelet with a magnetic closure. It is punctuated with the "Faith" motif and an infinity knot. You can either wear it alone or pair it with another bracelet. 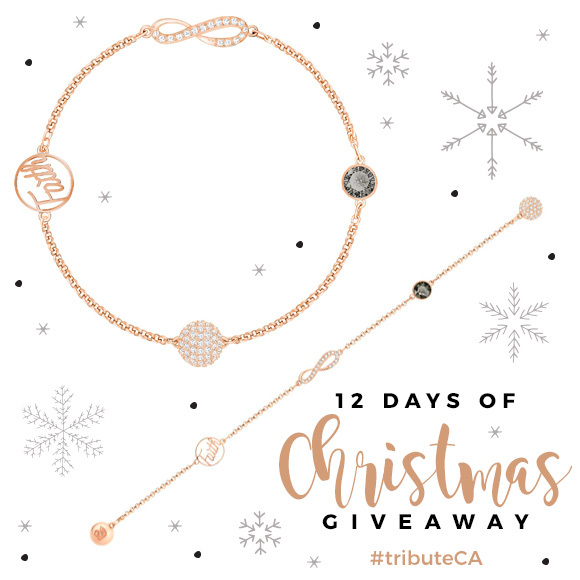 We are giving one lucky winner two of these delicate bracelets that you can choose to style as a choker, a wrap bracelet or wear it individually. The total value of the two bracelets is $178. To win this amazing gift, leave a comment below to tell us what is your favorite Christmas carol. The winner is Alayne Langford. Congrats! Don’t forget to come back tomorrow to enter our Day 2 giveaway! My favourite Christmas carol is Oâ€™ Holy Night. My mom sings it every year and it will always remind me of family. My favourite Christmas carol is I'll be Home for Christmas. Silent Night! I both LOVE and hate it, LOVE it because it's so beautiful and touches my soul and hate it because it's so beautiful and touches my soul and makes me cry, not little tears, the big ole ugly cry ha ha. My favourite carol is "The Little Drummer Boy" I have the Boney M version and I love it. My favourite Christmas Carol is "O Come All Ye Faithful / Adeste Fideles" . My favourite Chrismas carol is Santa Baby! O Holy NIght is the favourite. Oh holy night! There is no better a goosebump causing line then 'fall on your knees'. Goosebumps! My favourite Christmas Carol is The Christmas Song by Nat King Cole! So beautiful! My favourite is Jingle Bells. A Wonderful Christmas Time https://www.youtube.com/watch?v=hMhMekfIyos Paul McCartney is totally my fave Beatle! O Holy night... Love just about any acapella version! My favourite Christmas song is Step into Christmas by Elton John. I love "The Huron Carol"
Gorgeous!! My favourite Christmas Carol is Rockin'Around the Christmas Tree. Thank you for the chance! Silent Night hits me every time - the best is hearing it sung by a choir live. It's the Most Wonderful Time of the Year! It ALWAYS gets me into the Christmas Spirit! My favorite Christmas carol is White Christmas ! Grandma got run over by a reindeer is an all time classic that has been played on repeat many times, every christmas for as long as I can remember. The Twelve Days of Christmas. #Swarovski. #Tribute. The First Noel! Thanks for the chance to win! My favourite Christmas carol this year is: Someday at Christmas. "Someday at Christmas there'll be no tears All men are equal and no men have fears One shinning moment my heart ran away From our world today Someday all our dreams will come to be Someday in a world where men are free Maybe not in time for you and me But someday at Christmastime"
Oh Holy Night - sends chills down my spine. My Favourite Christmas Carol is Silent Night. Thank you Tribute for the opportunity. Oh, Holy Night is my favorite .Christmas carol. Thank you. Boney M's "Mary's Boy Child/Oh My Lord"
My favourite Christmas Carol is "Hark the Herold Angels Sing"! O Holy Night is my favourite Christmas Carol. Celtic Woman sing a stunning version of it. Hallelujah performed by Pentatonix. Their harmonies are amazing. Nat King Cole's "The Happiest Christmas Tree"! The Little Drummer Boy (Carol of the Drum) !! White Christmas, sung by Bing Crosby of course! My favorite Christmas Carol is "The Little Drummer Boy". We used to watch this every year with my Nana. She would come over and watch it with us. Really nice memories of a wonderful film and a wonderful Grandma. Such wonderful memories. I have so many but probably absolute favourite would be O Holy Night. O Tannenbaum the German version. Walking in a Winter Wonderland! We are in the midst of winter in Winter-peg! Thank you for the opportunity and Good Luck everyone! The Little Drummer Boy is my favourite! Silent Night, it really does describe what Christmas is all about. Walking in a Winter Wonderland would be on top of my list! Joy to the World is my favourite. It's such a triumphant song. Walking in a Winter Wonderland! We are in the midst of winter in Winter-peg! Thank you for the opportunity and Good Luck everyone! Happy Holidays! My favorite Christmas carol is Oh Holy Night. Would be Walking in a Winter Wonderland! It's beginning to look a lot like Christmas is my fav, and when Michael Buble sings it love hearing it. I saw Mommy Kussing Santa Claus. This is an awesome Carol. I Heard the Bells on Christmas Day has always been a favourite of mine. Give me Christmas Carols anytime of year to calm me down and make life a little more pleasant. My favorite Christmas carol is I want a Hippopotamus for Christmas. If it has to be a traditional carol, my favorite is We Three Kings. Rudolph the Red-Nosed Reindeer is my favourite - always puts a smile on the faces of those singing! Mary Did You Know! I love Christmas carols. jingle bells. Can't stop signing it. My favorite Christmas Carol is Jingle bell. It's always make me cheer up. I was just thinking in the car this morning how much I enjoy Mariah Carey's All I want for Christmas is You!!! I love the song "Mary, Did You Know." It is so meaningful. Silent Night! I love this song! My favorite Christmas Carol is Have yourself a Merry Little Christmas. God Rest Ye Merry Gentlemen by Bing Crosby. Guess I am showing my age suggesting this one. Iâ€™ll Be Hime For Christmas is always my favourite. Love the Christmas season and Christmas carols! My favourite carol is O Holy Night. My absolute favourite carol is Carol of the Bells! Bliss! My favorite Christmas carol is "Silent Night"
Go Tell it on The Mountain is my favourite. My favourite Christmas song is " Silver Bells " . My favorite Christmas carol is Marry Christmas Baby and Santa Baby, can't choose between the two. So many to pick from.... a favorite French Chrismas sing for me would be Minuit ChrÃ©tien. I love Christmas Carols and my favorite is Silent Night. My favorite Christmas song us Rockin' around the Christmas tree. I like Oh Christmas Tree. So many lovely ones but I do like 'God Rest Ye Merry Gentlemen'. My fav Christmas Carol is Good King Wenceslas. My niece and I have been singing a lot of Jingle Bells! My favourite Christmas carol of all would be The Little Drummer Boy. My favourite Christmas carol is It's Beginning to Look a Lot Like Christmas! My favourite Christmas Carol is Mary's Boy Child. Thank you! My favourite Christmas carol is "Santa Baby" sung by Eartha Kitt. Band Aid 30 - Do They Know It's Christmas? is one of my fav Christmas songs along with Faith Hill - Where Are You Christmas . Thank you for the opportunity. My favorite is the carol of the bells. huron carol is my fave! My favorite Christmas Carol is : Silver Bells! Gramma Got Ran Over by a Reindeer!!! My favourite Christmas carol is â€œDo You Hear What I Hearâ€ ðŸ˜. Thanks so much for this AMAZING contest ðŸ˜Š!! I have fond memories of listening to Silent Night with my parents. My favourite Christmas Carol is "We Three Kings"
It may not be a carol but "Simply having a wonderful Christmas time" by Sir Paul is my favourite. My favourite Christmas carol is O Holy Night! Especially when it is sung by Johnny Mathis! My favourite Christams carol is Little Drummer Boy. My favourite Christmas Carol is "Walking in a Winter Wonderland". Silent night is my most fav Christmas Carol. White Christmas would have to be my favorite. My favourite carol is O Holy Night; The Carol of the Bells comes at a close second. My favourite Christmas song is Silver Bells. I have two! Blue Christmas by Elvis and New York City Christmas by Rob Thomas. Thanks for the chance to win! My kids are just obsessing over your a mean one mr. Grinch, but I love the classic "dreaming of a white Christmas"
So many to choose from! But, If I have to only pick one - The Christmas Song. My favourite carol is I'll be Home for Christmas. Jingle bell rock! We always have a blast singing that one! My favourite is "Silent Night"
O holy night ...a message that will never be outdated so meaningful still for today .. I seen Mommy kissing Santa Claus!! My favourite is "Feliz Navidad"
My favourite Christmas Carol is me lol just kidding it is Rockin' Around The Christmas Tree. My favourite Christmas carol is â€œJingle Bell Rockâ€. My favourite Christmas carol is Jingle Bell Rock! Oh Holy Night this song always gives me chills when I hear it! My favourite Christmas Carol is Jingle Bells. Thank you for a great contest. I just love I'm dream of a White Christmas because in Quebec, sometimes the snow is not there. My favourite Christmas carol is Hark to the Bells. Thank you for the great contest. My favorite Christmas carol is "Away In a Manger". Carol Of The Bells, or The Nutcracker are my favorites. One of my favorites is Do you hear what I hear? My favourite Christmas song is "I'll Be Home For Christmas"
My favourite Christmas carol is Do You Hear What I Hear? My favourite Christmas Carol is Jingle Bells! My favourite Carol is The Christmas Song by Nat King Cole. I can't just pick one, so I'll narrow it down to Holly Jolly Christmas and Winter Wonderland. Petit Papa Noel is my favourite Christmas Carol it brings back so many great childhood memories. Little Drummer Boy. Even Jimi Hendrix covered this one! My favourite Christmas Carol is "O come all ye faithful "
My favourite Christmas Carol is "Mary did you know". It's a carol that really touches my heart :) Thank you so much for the chance to win. My favourite Christmas Carol is "Silent Night"
My favorite Christmas carol is Hark the Herald Angels Sing! My favorite Christmas Carol is Little Drummer Boy. Thanks for the opportunity. My daughter and I have a lot of fun singing Jingle Bells every year. Thanks! My favourite Christmas carol is White Christmas. My favourite Christmas song is Hallelujah - Leonard Cohen; it's so beautiful. I love them all but Carol of the Bells is definitely one of my favourites! Silent Night is my favourite! :) Merry Christmas! I just love O Holy Night. My favourite carol is Good King Wenceslas. Let it Snow is so cheery and warm! I'm a fan of baby, it's cold outside. Oh MAN! That's so hard though, lol. I tend to listen to the Glee Christmas Soundtracks, and the Best Man Holiday sountrack on loop this time of year. Probably Baby It's Cold Outside, from the Glee soundtrack. Maybe. Followed by Christmas Time To Me, by Jordin Sparks. LOL. My favourite Christmas carol is Last Christmas by Wham! I love listening to Ave Maria. I find it hard to say one is my fav; simply love all the festive melodies. I did sing in youth choir - O Holy Night was special. Mariah Careyâ€™s, all I want for Christmas is you! "What's This", from The Nightmare Before Christmas. My favourite carol is White Christmas. My favorite Christmas Carol is Blue Christmas by Elvis. O Holy Night is my favorite Christmas Carol! Being in the military my favourite Christmas song would have to be â€œIâ€™ll be home for Christmas â€œ. Not making it home very often to spend time with my family during the holidays. Any Christmas carol that Michael Buble did a cover for! My favourite is Joy to the World! "O Holy Night" sung by Michael Crawford is absolutely amazing. He takes it to another level of brilliance. "O Holy Night" It takes me back to my youth when my sisters would sing this in church. My favourite Christmas Carol is Mary Did You Know. I love singing Silent Night while it snows outside and the fire place is on. Cozy!! My favourite is baby itâ€™s cold outside!! I've got a soft spot for 'O Come All Ye Faithful', as sung by Mahalia Jackson. I really enjoy Silent Night. Gives me happy chills. Jingle Bell Rock gets me singing. A joyous time with family and friends and to be grateful. I love it. Merry Christmas to all. Silent Night is my favourite Christmas carol for a snowy night beside a crackling fire with a festive drink in hand. Love giveaway, thank you! My favourite Christmas carol is The Little Drummer Boy. Silver Bells... it's Christmas time in the city. Where are you Christmas. Thank you for the chance! Joy to the world..great and uplifting Carol..the world needs some of this! Silent night by Boney M! Christmas Carols make me happy in general, but I love Grown Up Christmas List. Amy Grants version. Canâ€™t not sing Let It Snow whenever I hear it! One of my favourite Christmas Carols is Silent Night. I have several favourite carols! My favourite is White Christmas! My favourite Christmas Carol is Joy to the World. Love "Baby its cold outside" ! - thanks so much ! My favorite Christmas Carol is the Little Drummer Boy! My favourite Christmas carol is Itâ€™s the most wonderful time of the year! Is Last Christmas considered a carol? Lol its my favorite Christmas song! My favourite Christmas carol is Feliz Navidad. I have always loved Grandma Got Run Over By A Reindeer by the Irish Rovers! My favorite Christmas carol is Do You Hear What I Hear and it must be by Bing Crosby! It's the 1st song I play after we get the Christmas tree up! Mele Kalikimaka. Makes me think of the pool scene in Christmas Vacation every time! I'd love to be in Hawaii once during Christmas so I could actually say this! My favorite Christmas carol is Do You Hear What I Hear! Thank you! Jingle Bell Rock is my favorite Christmas song. Rudolph the Red Nosed Reindeer since it's the first one my son ever learned. My best Christmas Carol is "Do You Hear What I Hear"
Doris Day's version of "ToyLand". I know it's not technically a Carl; but, it's the one that means the most to me. Silent Night has always been close to my heart. Carol of the Bells - it makes me smile! My favourite is Carol of the Bells. I love Christmas Carols but I think my favourite is Hark The Herald Angels Sing! merry Christmas MARY by Paul overstreet! Rudolph the Red Nose Reindeer. I love the old favourite Feliz Navidad! Certainly one of my favorites The Little Drummer Boy ðŸ¥. Such a sweet song that brings back many precious memories. Mom would stop what she was doing and sing along when ever she heard it playing. My favorite Christmas Carol is Jingle Bells! Love Silent Night! Cmon Santa. Jingle bells is the best! After thinking about all the Christmas Carols I chose "Joy to the World" and Happy Holidays to everyone at Tribute! The Little Drummer Boy - my daughter sang this at her kindergarten Christmas concert years ago - I have love it ever since! I love Fall on Your Knees, listening to an instrumental version of it right now. O Holy Night is my favourite. â€œThe Huron Carolâ€ is my favourite. I wish it was played more often. Grown up Christmas List by Buble, captures the feeling of an adult at xmas perfectly! My favorite is the Huron Christmas Carol. My favourite one is Silver Bells! I love The Huron Carol. I've just learned it with my chorus (four part a cappella) and it's really haunting and lovely. My favorite Christmas carol is Santa Baby! My favorite is O Holy Night, I remember singing it at church standing beside my mum,it reminds me of her. My favorite carol is Rudolph the Red Nosed Reindeer. Thanks for the chance to win! Silent Night is my favorite. It brings peaceful memories of cherished family members who are no longer with us, especially my son. I love "O Holy Night". My favourite is 12 Days of Christmas! Happy Xmas/War is Over by John Lennon is my favorite. My favourite Christmas carol is Marshmallow World, if that counts! My favourite Christmas Carol is God Rest Ye Merry Gentlemen. My Favorite Christmas Carol is, The Christmas Song. I remember being a kid with the wonder and excitement of waiting for Santa that special feeling that never went away. I saw the same magic in my children eyes and now in my grand children. And so I'm offering this simple phrase To kids from one to ninety-two Although it's been said many times, many ways Merry Christmas to you, Merry Christmas to you. My favourite Christmas song is Oh Holy Night. Not a carol per say but Baby it's cold outside! Oh Tannenbaum Charlie Brown Xmas. My favorite Christmas Carol is Silent Night. It just gets me everytime. My favourite carol is I'm Dreaming Of A White Christmas sung by The Drifters! My favourite Christmas Carol is the christmas Waltz. My favourite Christmas Carol is "O Holy Night". My favorite would be "Winter Wonderland". The little drummer boy is my fav. My favourite carol is Silent Night. My favorite song is called Country Christmas. It's not very popular but I love the song. "Silent Night" is my favourite Christmas carol. My fave is Rockin Around the Christmas Tree. My favourite Christmas carol is Winter Wonderland. Silent Night is my favourite. Silent night is my fave! Twas in the Moon of Wintertime has been my long time favorite. The Little Drummer Boy (Peace on Earth) by Bing Crosby &amp; David Bowie is my absolute favourite! I like The Christmas Song. I like Silent Night is my favorite Christmas song. carol burnett. or ricks kid from the walking dead. My favorite Christmas carol is Silent Night ! My favourite Christmas carol is Oh, Holy Night. My favourite Christmas song is Please Come Home For Christmas. My favourite Christmas carol would be "Oh Come All Ye Faithfull" along with "Away In A Manger." O Holy Night is my absolute favourite! White Christmas is one of the best songa. Deck The Halks! Iâ€™ve had it stuck in my head all day! I would have to say that my favourite Christmas carol is "O Holy Night". Thank you kindly for the contest. My favourite Christmas Carol is White Christmas! O Holy Night, it's a classic! My favourite Holiday carol is O Little Town of Bethlehem. Silent Night is still my favourite! My favourite Christmas Carol is Oh Holy Night. Silent Night. It's a classic. My favourite Christmas carol is Jingle Bells. My favourite Christmas carol is "Little Drummer Boy". Jingle Bells is my favorite! O Holy Night is very soothing! Silent Night.....it's calming and soothing and reminds you of what Christmas is all about. Mary did you know is my favorite. I like White Christmas ! The Christmas song is my favorite. O Holy Night is my favourite carol. My favourite Christmas Carol is "What Child Is This". My favorite song is an oldie called the march of the tin soldiers. any version of "Please Come Home for Christmas"
"O Holy Night" is definitely my favourite. What Child is This. It is so beautiful. My fave is oh holy night. My favourite carol is Hark the Harold Angel Sing! Merry Christmas! My favourite Christmas carol is "Do you hear what I hear?" One of my favorite Christmas carol is "Christmas in Hollis," Run-D.M.C. My favourite Xmas Carol is Rudolph the Red Nose Reindeer ever since I could sing it. my favorite christmas song issilent night. The first Noel, because it rhymes with my name! I've always really liked Silver Bells. My favourite carol is the beautiful "O,Holy Night". Silent Night...I sing it every night since my two were born to them!!! Sweet dreams. O holy Night ....it gives me chills. My favourite holiday song is Silent Night! My favorite Christmas Carol is THE LITTLE DRUMMER BOY. I want a hippopatumus for Christmas. It depends. If you are talking Christmas carols, then it would be Hark The Herald Angels Sing. If you mean Christmas songs, then it would be Santa Baby by Ertha Kitt. "And so this is Christmas...."
Silent Night is my favourite! Stille Nacht, which is Silent Night in the original German. Silent Night - mellow, but uplifting! Oh Holy Night is my favourite! I love Carol of the Bells! My favorite Christmas Carol is ALL I WANT FOR CHRISTMAS IS YOU!!! The beautiful haunting melody of "O Holy Night". Oh Night Divine still brings tears to my 64-year-old eyes. Definitely O Holy Night. Beautiful song. Oh Holy night is my favourite. It used to be 'Silent Night' for over 30 years. But once I had heard the hauntingly beautiful melody of 'The Huron Carol' I reconsidered and fell under its spell for every year thereafter. It has a simple simple air, lovely words, and describes Christmas perfectly. I love the song "O Holy Night"